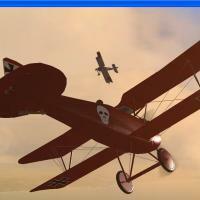 Fly as Godwin Brumkowskis in his AH Albatros D3 OEF and take on Italian ace F.T. Baracchini in his Hanriot D1 over Northern Italy. This mission needs add-ons Hanroit D1 and the AH Albatros D3 OEF and the new Northern Italy map by Ferda Mravenec.